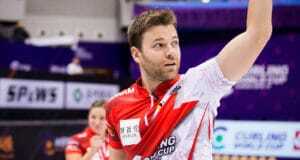 While it’s a relatively quiet week on the World Curling Tour for the women, the “Men of Curling” are making headlines in more ways than one. LAS VEGAS — A sleepless night in Las Vegas can mean a lot of things, but for Team North America’s Braeden Moskowy, it was the bad kind — a congested head that left him feeling miserable and unable to sleep. Sixteen of Saskatchewan’s best men’s curling teams faced off Jan. 30-Feb. 3 in the Melfort Arena with a coveted berth in the 2013 Tim Hortons Brier in their sights. The 2012 Tim Hortons Brier will be contested March 3 – 11 in Saskatoon’s Credit Union Centre…. that much we know for sure. But the question of who will be curling in home-province colours is still to be decided.